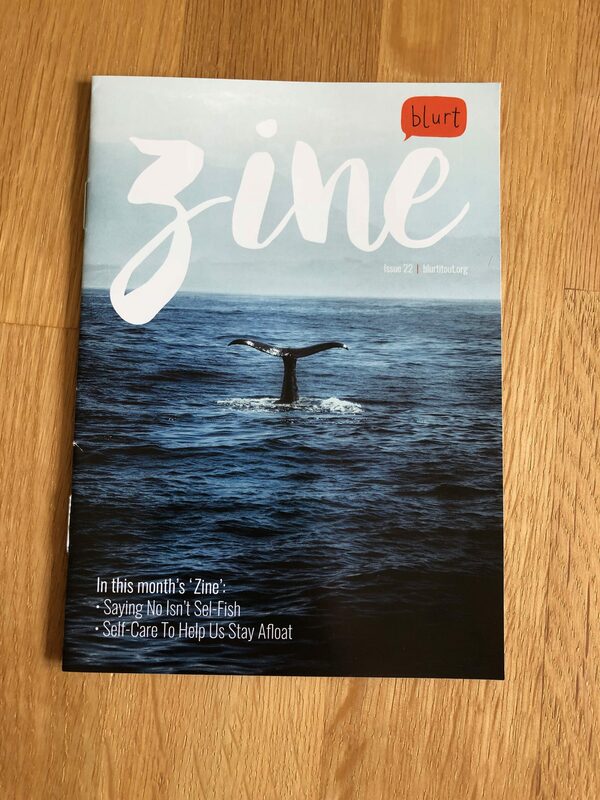 As I read the book *“The Self Care Project” I found out about ’Blurt out’, an organisation that is there for people with mental health problems and people like myself using self-care to improve their chronic illness. I researched a bit about them and found out they actually did a monthly subscription box. Of which they call a Buddy Box. All about self care and cheering someone up. 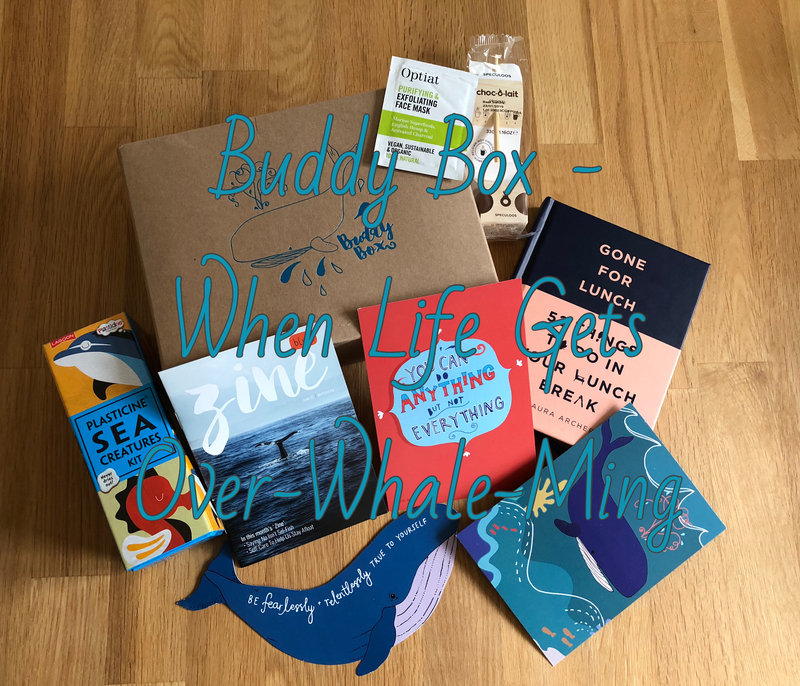 The box can be for anyone and you can also sponsor a box to give to someone who needs cheering up. I also love the fact that you can sign up for the one box or monthly! It’s £21.50 a month which is an expensive box, but I also would love it if this turned up unexpectedly sent by a friend who knows I need a little more TLC. I thought I would give this buddy box ago and share it with you what I got. 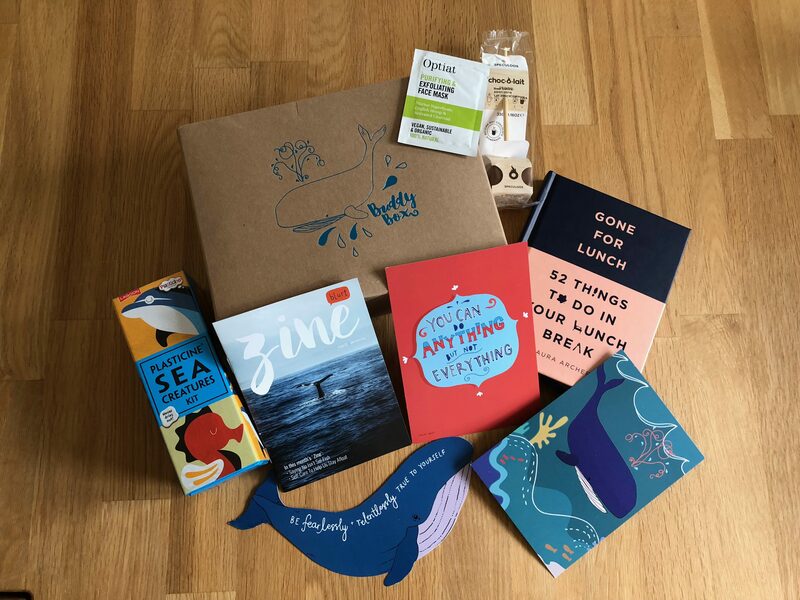 This is the August 2018 box and this box is called ‘When Life Gets Over-Whale-ming’ I love that they tie animals into phases relating to life. We all know life can be overwhelming, too much or all going wrong. These are problems everyone suffers with. Its ok to have bad days as we know these days will pass and better ones will come along. For a first impression of this box I wasn’t sure what to expect really. Its hard to think of what everyone could do to help their life especially as everyones problems are different. That in mind I love the packaging. 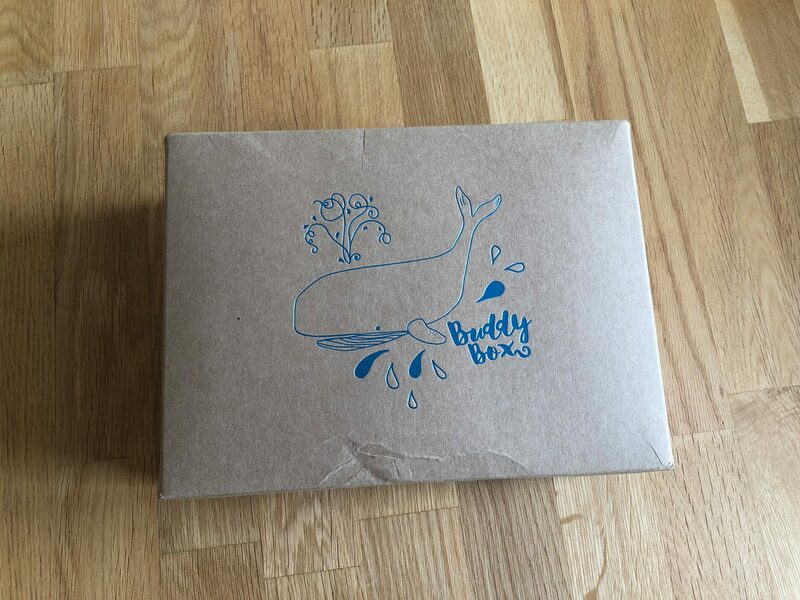 The simple cardboard box with the metallic blue whale and wording of buddy box. Simple but cute. When you open the box, it reminds me of being a child at Christmas. The smell of cardboard boxes as you opened your toys. 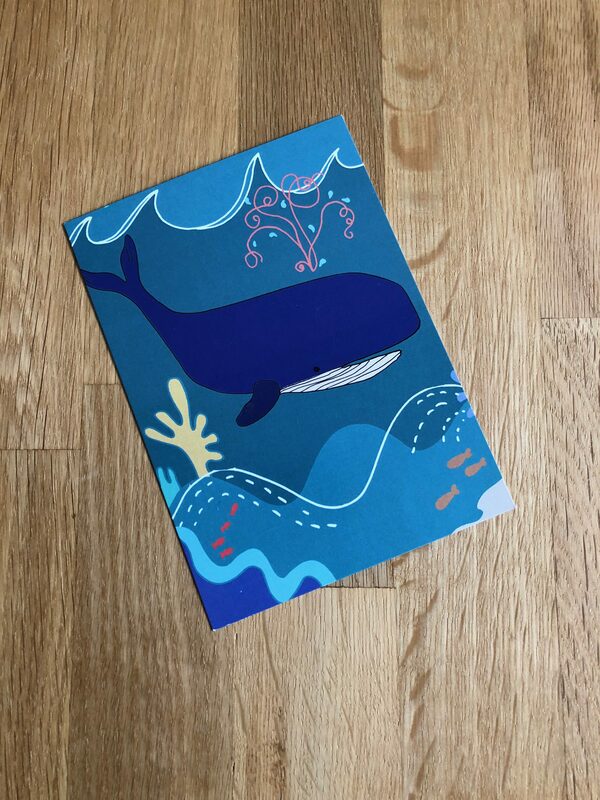 You open it to these cute white tissue paper with the blue printed whale all over. The tissue paper is slightly too small to cover the products so you can sneak a peak through. So once I opened the tissue paper I selected my first product, which I find completely random but I know being creative and colouring especially really helps with self care and allows you to relax and wind down for the day. 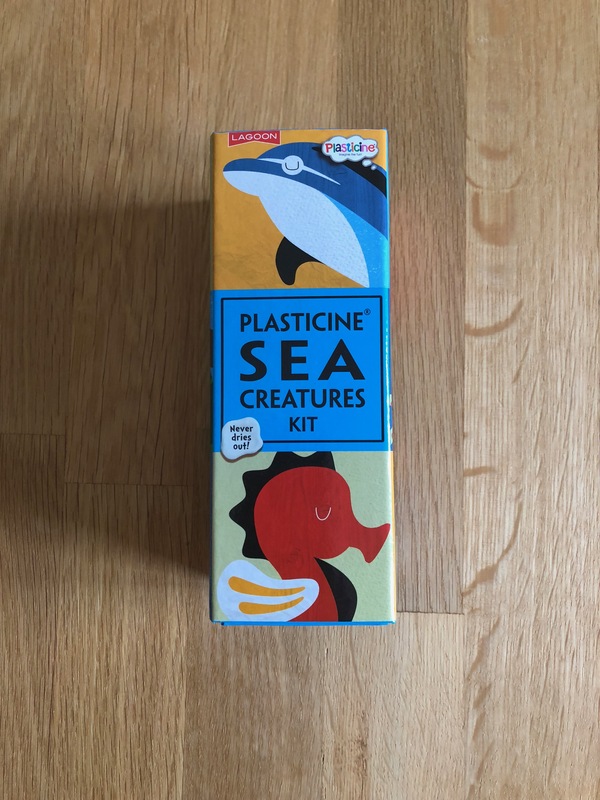 So this plasticine sea creatures kit is cute. Something I would of loved as a child. But none the less I will be getting these out and make them after a bad or stressful day. Maybe I will make one creature a time. Like I have said before I love to make and create various things. Its part of my self care anyway. Its something I love and I am also good at. So these will be something I can try and maybe buy some more. The packaging on this is so bright and colourful displaying animals in various colours. Its also very heavy. 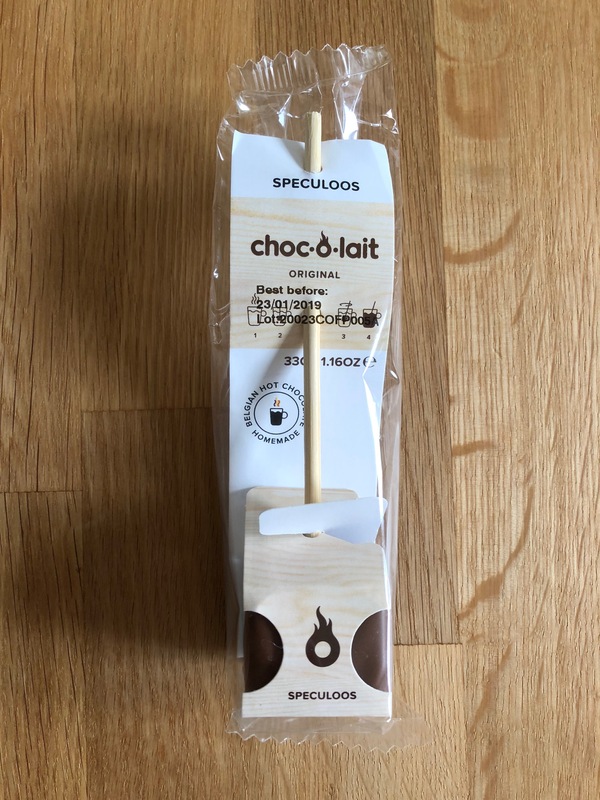 The next thing I have pulled out the box is a choc-o-lait speculoos. I don’t drink hot drinks purely out of choice. I don’t like them so I wont be using this. But if you do I can really see this helping on a cold rainy day when you want to curl up on the sofa and stay cosy. Its really cool to be able to just dunk that square of chocolate in a cup of water and stir. It sounds amazing even to me and I don’t like hot drinks. I could really do with a duvet day. 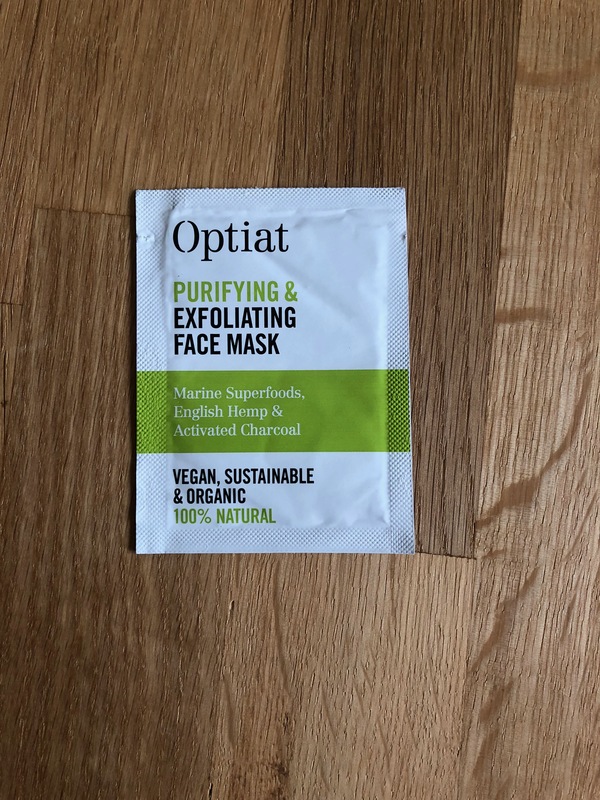 The next thing I grabbed is the Option purifying and exfoliating face mask. This is vegan and organic. 100% natural. To me a spa day at home or at a spa is a Yes please. Must do kinda thing. I often lay in the bath with the candles alight . I can’t wait to mix this mask up and put it on. Chill and unwind and feel good about yourself. The next thing is a book mark, I have various books on the go, some fiction and others that are for me to learn from and teach me ways to manage different things in my life, so a book mark is really handy for me. This is relating to the box and its a whale. Its quite big for a book mark but every time I look down at this book mark it just makes me smile. I don’t really know why but there you go. The words are completely true though. 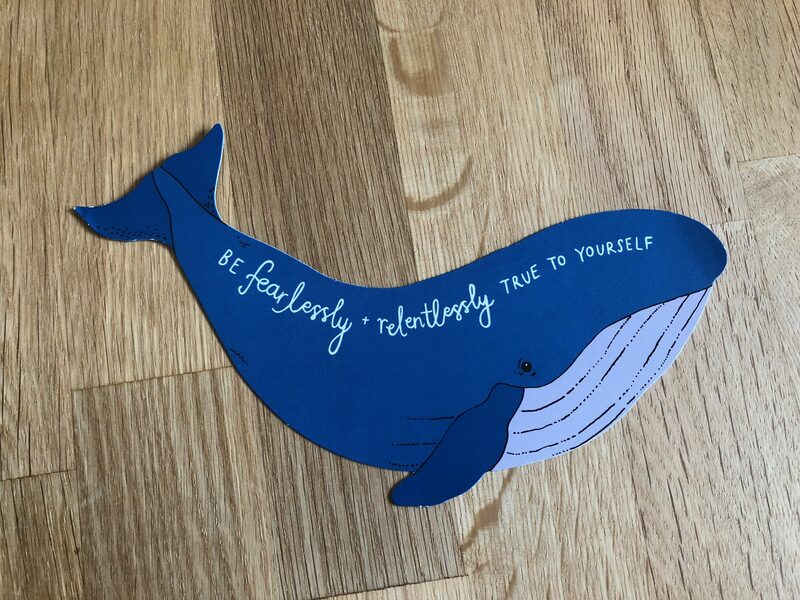 “ Be fearlessly and relentlessly true to yourself’. I can’t wait to put it in my book. I think one to encourage me would be a good idea, to read the words to remind you each day. The next is a leaflet called ‘Zine’ I have just read it as I type this paragraph and yes yes yes. It covers saying No isn’t sel-fish which is something I need to do. I need to learn to say no. The second being self-care to help us stay afloat. Which is completely true. I use self-care each and everyday to keep going, live my normal life I want to or have to live. The back of the booklet quotes ‘scared is what you’re feeling, brave is what you’re doing’ this is so true. I feel I am really brave for letting you all in on how I cope with things or try to anyway. 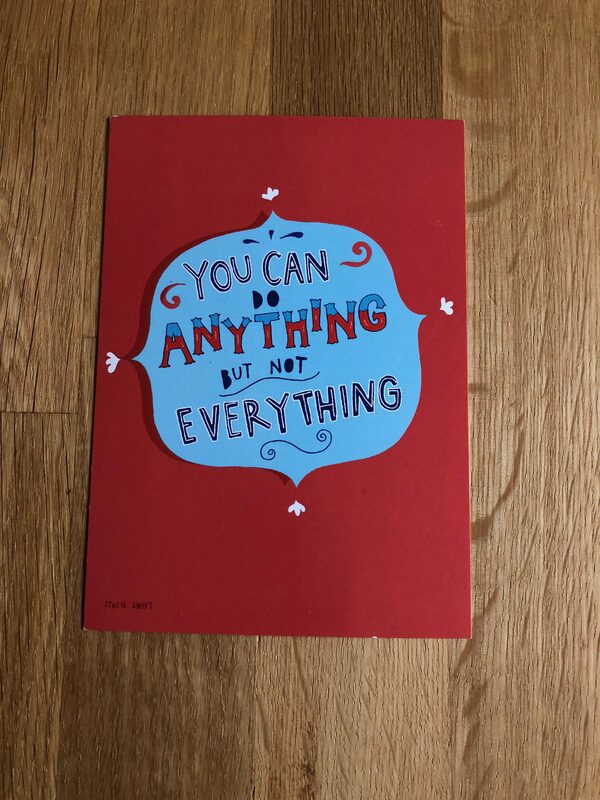 The next is a cute postcard, I love the quote ‘ you can do anything but not everything’ this is totally true and I know deep down in my heart there are things I would love to do that I won’t be able to. That is life. 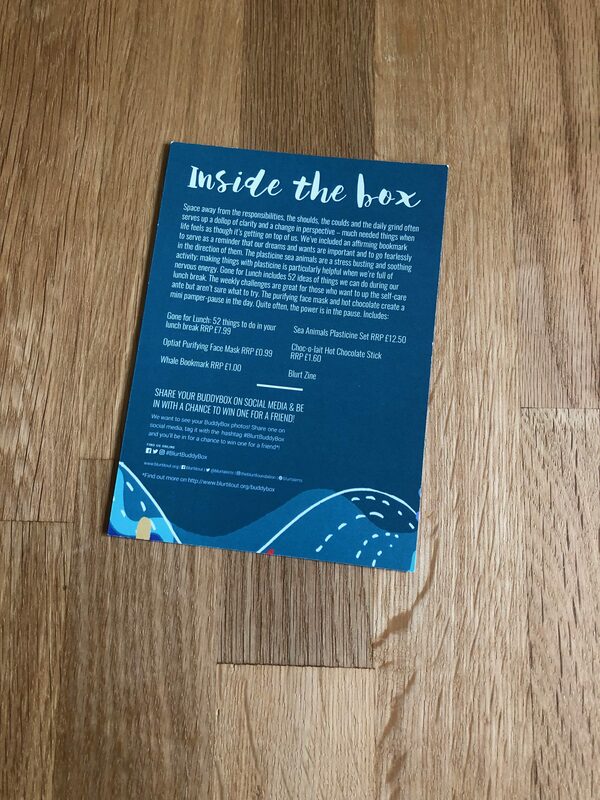 The other postcard is a whale and it just tells you all about whats in your box and the pricing etc. The last thing in the box which I believe has to be my favourite and something I could see myself buying to give as a gift and especially good for secret Santa gift. I love it. 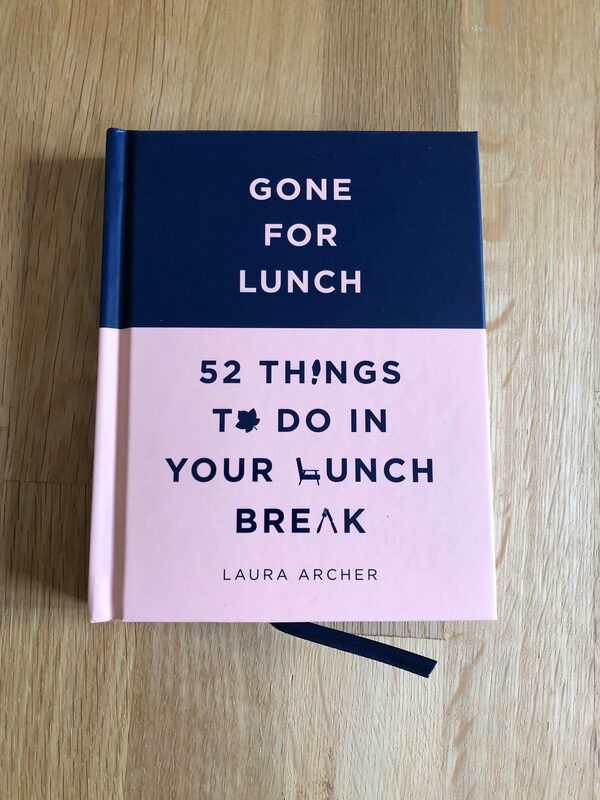 Its a small A5 book called “Gone For Lunch – 52 Things To Do In Your Lunch Break’ it has absolutely everything in there from gardening to knitting a scarf to desk yoga. Who doesn’t get bored at lunch? My lunchtimes tend to be me sitting at my desk on my phone answering emails from brands or collaborators, to watching my youtube friends videos. I really want to try desk yoga. In the back of the book it has your challenges and you can write down each one you pick to do and your progress. I can’t wait to read this more in depth and try a few or all of them. That is it for this box. Its an amazing box that has really put a smile to my face. If you need cheering up or know someone who does please do that random act of kindness and send them a box. I know I brought this box myself but I love it. It really has put a smile on my face and excited me to go try these things. You can learn each and everyday from anything and trying new things is a yes! Go do it try make a plasticine sea creature, go for a walk, or do desk yoga. Improving your life is something anyone can do. It really is. I love this box I am excited for the week ahead now and I can truly say self-care really does help me. I really have struggled this week I am not going to lie, everyone has bad days or weeks, this was one of mine but it just shows that something as simple as this box can help. Self-care is so important I have shared everything I know today really other than the easy basic stuff. I will be wrapping up this series next week with what I have called Self-Care – Living With a Chronic Illness. I am not saying I will not be posting again about this and maybe as I learn more I will share. Of course I have endometriosis for life so there are bound to be ups and downs I can share. Would you get this box? Or do you know anyone who could really benefit from this box? What is your favourite item in this box? 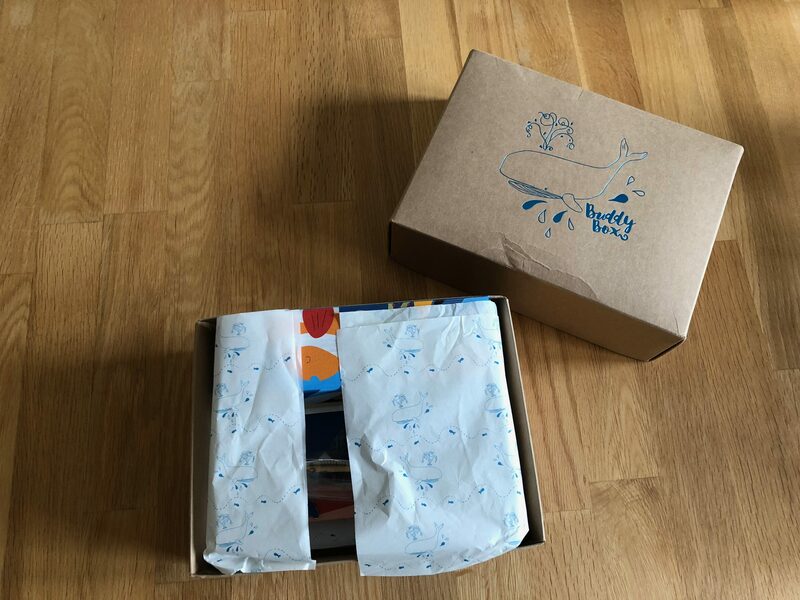 This looks like such a great box (and I love your descriptions!) Very cool! This is such a wonderful box, an amazing gift! I definitely have a few friends that I’d love to gift this too, if only it were in Australia. What an amazing box. My favorite item is the face mask! Love that mask! I’m afraid I already multitask right through lunch hour. Sigh. This book is amazing. I want to try everything in it. But I multitask too or get interrupted with questions anyone could answer. I need to start leaving my desk more. Try something different tomorrow and see.